Folsom High Music Teacher Curtis Gaesser has been named a finalist for the Grammy “Music Educator of the Year” Award. Mr. Gaesser was named one of ten Finalists out of more than 2300 applications for the esteemed Educator of the Year Award for 2018. 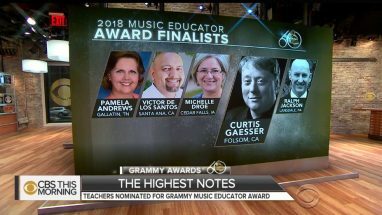 The honor is presented by the Recording Academy and the Grammy Museum to teachers who have given “significant and lasting contributions to their field.” Nine of the finalists will receive a grant of $1000, while the winner and the school will each receive $10,000 for further promotion of music education. More than just a music teacher, over 30 years, Gaesser has led the Folsom High Jazz program to national prominence, winning Downbeat Magazine’s ‘Best in the Nation’ awards for Big Band and Jazz Choir a combined 32 times, including the past 4 years running. In addition, Folsom High bands have played in venues from Monterrey to Montreaux. The winner will be announced in early January, and honored at the Grammys on Sunday, January 28 in New York City. Congratulations to Mr. Curtis Gaesser!